You are here: Home > Concerned About Our End Of Life Post For the HTC Sensation4G/Amaze4G? Don’t Be. Judging by your comments, Tweets, emails and Facebook posts a number of you expressed some concern and confusion over our recent “End-Of-Life” post for the HTC Amaze 4G, Sensation 4G among others. In hindsight, I suppose I should have made sure this was put into the post surrounded by neon lights to avoid any confusion or panic, but “End Of Life” only means it is the end of the “shelf life” for the phone. In other words, the phone will no longer be sold once the end of life is actually put in place, which we emphasize could still be weeks away. 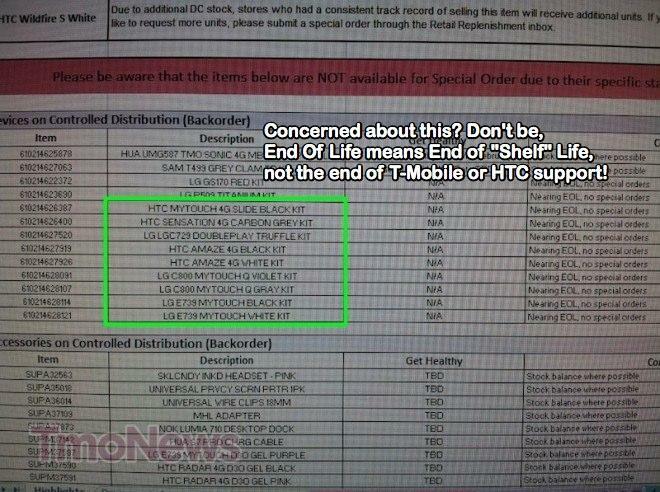 This DOES NOT mean the end of T-Mobile or HTC support, or the cancellation of planned Ice Cream Sandwich updates which are still scheduled for the Amaze 4G and Sensation 4G. There is no reason to be concerned over those updates and the phones remain covered by their warranties. I have little doubt HTC will continue to update them as planned. All this being said, let’s re-emphasize that there is no reason to be concerned over that post as this isn’t the first instance T-Mobile or its competitors have set a number of phones for end of life at the same time. It is clear however that T-Mobile will have to replace them with alternative (and likely improved) models so we’ll just have to kick back and wait and see what Magenta has in store. You question the populations intelligence because of THIS post….? HHhaahaha. Scott, Im sorry but I now have to question your intelligence. lmao. thank god i just got the amaze 4g as a replacement from G2x. It’s because people don’t read the articles, just the headlines. As much as I complain about people who do that, I was guilty of that when you made the original post about the EOL. Really, there was clarification needed? Oh yes, plenty of concerned emails that I just had to address it, trust me, I wouldn’t have thought this would be an issue. Or to put it another way gouvy, many people are stupid and can’t think for themselves, but you are obviously the inteligent one. Right gouvy? Quite sad indeed. now you are just putting words in my comment byrnie… I thought you were supposed to be the mature one and me the big, atheist, internet jerk?? what happened?? I don’t think i’m actually smarter than anyone truth be told, my dear byrnie. I just think people have been conditioned to want instantaneous gratification from anything. I’ve noticed people becoming lazier and lazier having “first world problems”. This become apparent to me when I was in grad school at tufts university and a really bright phd did a thesis on how computer science may ultimately end up stripping away the will for a human to perform basic functions. Oh gouvy, I never called you an internet jerk. Quite the contrary, I’m beginning to take a shine to you. I’m impressed by your analytical comments and promise to take it easier on the “defending Mother Magenta” LOL! Take care gouvy. Have a nice day! That would be me, not taking myself seriously because it’s the internet. You are correct, you never called me an internet jerk. I called myself that because thats how i am to the sheeple. You are the one who usually puts words in my comments, not I byrnie. I’m trying to help you not be a sheeple and take your internet self less seriously. Hell, i enjoy my crap talking to you and the other sheeple while drinking a nice glass of cabernet sauvignon. It’s probably the reason some words are mis-spelled half the time, great way to relieve stress at the end of the day aside from banging the wife’s eyeballs out of her sockets but that’s another subject in and of itself. Althogh, I do have a question: does anyone know the average shelf life of “high end” android phones on T-Mobile? Seems rather early to stop selling the Sensation and Amaze, and if I remember, the G1 was still on sale early last year (not sure). Yes, I think T-Mobile made a huge mistake selling long-outdated smartphones like the G1 and Behold II so far passed EOL. Average Joe Customer buys one and thinks he got a good deal. When he gets it home, he finds out it lags and can’t run current apps, yet still requires an expensive data plan. Customer then returns device, cancels contract, says “you get what you pay for” and goes to on of the other 3 carriers and gets an iPhone…damaging the reputation of HTC, T-Mobile, and Android all at the same time. I love it. All the comments I read where people were freaking out and “leaving TMobile” because of this…what clowns. My guess…someone found a missing pallet of them in a warehouse somewhere and needs to unload them. You can still buy a brand new Behold II now, which is a total embarassment. T-Mobile and Samsung should just donate or scrap those unsold Behold IIs at this point…selling them will damage both companies reputations AND cost more in customer service than that old stock is worth. I gave my behold 2 to my 65 year old mom. She thinks its great. At the time of purchase I regretted it. But am happy it is getting some use! In other news… T-Mobile UK is offering TRULY unlimited web with free tethering, unlimited text, unlimited mobile-to-mobile and 2,000 minutes for $54. Why in the hell can’t T-Mobile US get their plans together like that? Are you sure it’s $54, not £54 (roughly $84)? It’s not that much different than the Value plans and Europe doesn’t do subsidies. So for $5 more the US has unlimited talk, text and web(2GB). LOL. T-Mobile is NOT getting a version of the Galaxy Nexus with faster network speeds. Sorry bud but that’d mean they’d have to change more internals than just the amount of ROM and it’s not gonna happen. Give up that pipe dream you have and quit smokin’ it while you’re at it. DO U HAVE ANY INSIDE INFO ON THIS….hmmm guess NOT. What makes u think that a Networking that has carried the Nexus since its inception will not carry it this time around. Even if they don’t have a GNex with a faster HSPA+42…they will get it at some point, my guess within six month or so. I see no reason why they won’t. Actually, in TMO speak, EOL means that they will no longer be ordering more from the OEM. If there is a lot left in the warehouse, it will continue to be sold until the inventory drops low. Devices can be in stored and for sale for months and months on EOL. Galaxy Nexus if recent rumors are any indication. But I would be furious if T-Mobile released the Nexus. I was calling Customer Service five times a day asking if they were offering the phone and most of them transferred me and said no. I then was offered a SGSII for $99.99 with no upgrade fee and shipping fee. I like how all the recent news all had a question mark at the end of the title. I never equated “EOL” to “end of support”. In fact, I welcome EOL because that mean something newer and better is coming. It doesn’t even mean that the phone will no longer be sold, only that no new orders to the manufacturer will be made. Existing inventory will continue to be sold, and odds are that T-Mobile’s web site will continue to carry them for quite a few months to come. The G2 was EOL’d quite awhile ago, and it’s been recently re-added to T-Mobile’s web site at a fairly low price. I don’t know if the powers that be decided to put in another order to fill in an empty customer niche, or if they found several crates of them in a warehouse somewhere. Nevertheless T-Mobile is selling them again despite the fact that they were EOL’d many moons ago. I’m going to be so mad if the iPhone doesn’t come to tmobile this year. I’ve been waiting ever since verizon got it. My contact has expired for over 2 years now. If tmobile doesn’t get it, I’m leaving for another carrier. So you would pay almost double the price(monthly) to have a phone that does the same and in some instances LESS than the phones T-Mo carries? Just unlock an iPhone and use it. There is no 4g iPhone yet anyways so internet speeds are slower no matter what (albiet on edge it will be even worse, but not much compared to ATT 3g). I wouldn’t actually do that for a phone. I love T-Mobile but I also really prefer the iPhone to android devices. I’m using an unlocked one now but I’d rather not spend $600+ to have an unlocked one. It’d just be really cool if I could just have one for $200 for just upgrading my line. Agree. I’m leaving for the AT&T iPhone in less than a month. Even their HD7 was a badly built piece of crap, and don’t even start me on the Vibrant. Finally sold that thing to ETF that line last week. I’m totally paying a grand to change carriers (ETF lines) and get iPhones and I won’t regret losing one cent. Tmobile already said they do not plan on ever carrying the iPhone, they want to remain strictly Android. And I hope they don’t sell it, I’m glad Tmobile is sticking to Android only….there is nothing the iPhone does that Android doesn’t do, and Android does it better! and the source for that assertion is….? Ive had g1,g2, and now sg2. all these phones work flawlessly. As far as apps, IPhone has more, but thTs comparing like 500000 apps to 1000000 apps, you will never even look at more than 300 and use only 40 at most, so to say IPhone has more apps is like saying some cable network has more channels than anothed…..you wont be watching those extra 500 channels for sure. Also Android has more free apps. I think Android devices are just too complicated for u, so u should go get an IPhone, Android insnt for everyone. lol complicated. I build my own computer when I want one. I know how to root/unroot my phone. First which phone you have? Reason i ask is because Android is like a PC more in the lines of Windows. Depending how the manufacturer programs there computers depends how good it is and that same idea goes for Android. This idea doesn’t follow iphone for obvious reasons. The iphone gets regular updates, because who else is manufacturing a iphone..only Apple. Apple created the devices they made the software they have total control. Android on the other hand is OS available to anybody which means a large amount of phones to choose from. If your going to dip into the Android world you need to research before buying a phone. And not those tech sites that only have it a week and give it a good score we are talking about forums, user reviews, review sites that take dedication for example anandtech. The reason why is because Apple has one major device iphone while Android has a whole sea that can be filled with badly coded phones for example the Atrix, the G2x, actually most LG phones. Then we have badly made phone hardware wise, HTC Thunderbolt, the Dart and much more. Sadly thats how the Android world is, its available for all to use but that come with the consequence of having alot of phone with bad flaws. Oh and by the way knowing how to building a computer and root/unroot doesn’t mean you know how to handle complicated things, no offense to you but i believe a simple tutorial on youtube or well written guide can make some of most dim-witted people know how to do those things. Actually the software is better depending on how u look at it. The past thre androids I have had we’re the worst OS experience I have ever had I would turn my phone on and I would have to go into an app through the notification bar just to have access to my home screen or the phone would turn off randomly or just drop signal for no reason. On the other hand the iPhone 3GS I got for 50$ of eBay and jailbreaked has been more reliable and much more pleasant experience the only exception would be 4g but that I can get over ecause it still allows video streaming even over edge. Umm.. What kind of videos are you watching that can be streamed over Edge? I’m shocked that so many people don’t know what “End of Life” means. Why would you be shocked that people who don’t work in retail don’t know what that means? After all, in any other setting, end of life means death. As in, no more life whatsoever. My sensation works sensationally. I use it for work and play no issues. Where I work, we call this “End-of-Sale”. “End-of-Support” is when software update and/or bug fixes stop being created and “End-of-Life” means the product can will no longer be repaired. When we end of life a device it is so we can relace it with something better either at the same price or a sale price. does it concern anybody else that a phone like the amaze4g that has only been out since late october is already slated for end of life? So phones basically have a shelf life of 5 months? And then we wonder why updates aren’t forthcoming? I am a major android fanboy but the manufacturers really need to slow down the release of new phones. Nah, the HTC Rezound and the Samsung Galaxy Nexus made the HTC Amaze 4G obsolete only one month after it came out. T-Mobile needs to address that by putting out a phone with a 720P display, preferably with Ice Cream Sandwich out of the box. What HTC/T-Mobile should have done was held off on the Amaze and signed a deal to get the Gal Nexus and/or Rezound at the same time Verizon did. Unlike T-Mobile, Verizon timed things well. Their latest batch of top phones have remained the top dogs across all carriers for several months running now. As far as T-Mobile’s misjudgment is concerned, odds are they thought they’d be part of AT&T by now and it wouldn’t matter. So sales in the 3rd quarter of 2011 were likely more important to them than sales in 1st quarter 2012, or even 4th quarter 2011. That last sentence should read: So sales in the 4th quarter of 2011 were likely more important to them than sales in 1st quarter 2012. Nope, not concerned one bit. More worried what will replace them.